First install NET Framework 4.6.2 on the computer used to prepare Active Directory. 2. Perform the following Windows components. 3. Start ALL services with the word Exchange before or after the word. Configure the Mail accounts on the 2 clients. Limit the annexes to 2 mb for testing. Disable everything and release what is allowed. An Active Directory schedule update is performed, which cannot be reversed. 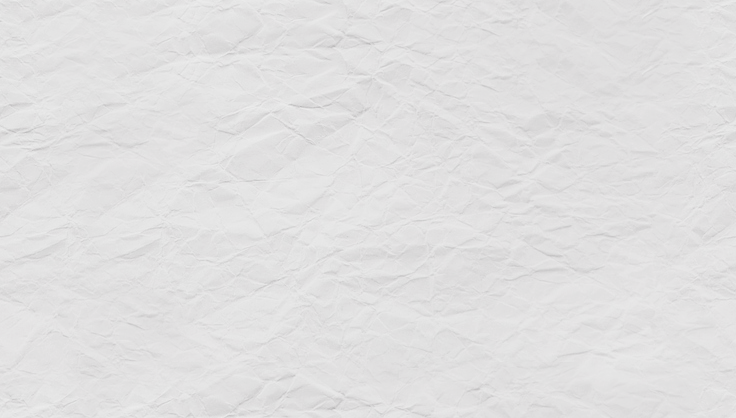 Make a backup of the Active Directory before you start when you consider it necessary. When Microsoft Exchange is installed for the first time, you have to choose an Organization Name. The Organization Name cannot be changed at the back. Download and install NET Framework 4.5.2 on the server whose Active Directory schedule is being updated. 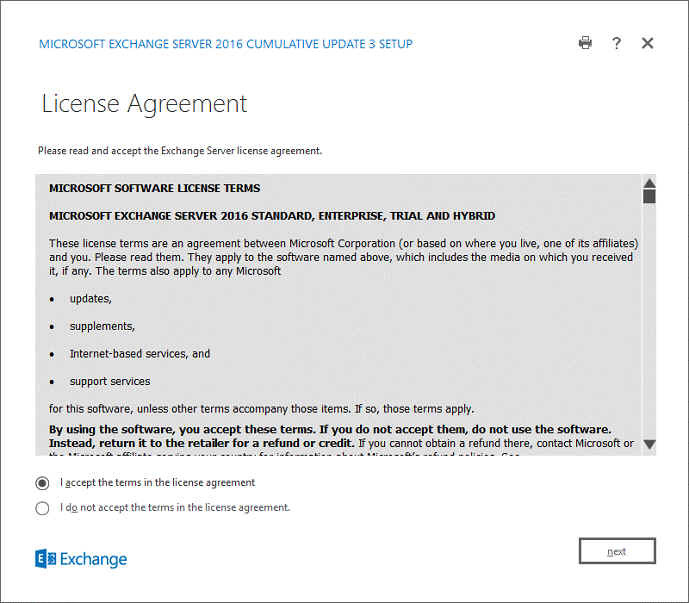 Only Microsoft Exchange 2016 Cu3 and later supported Windows Server 2016. Inp6 must be enabled together with Ipv4 on the network card. Do not turn off the two TCP/IP versions. 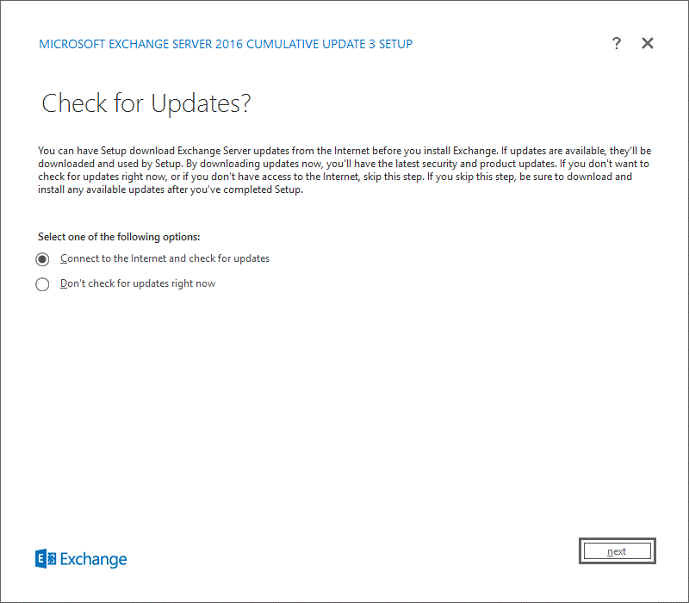 A new installation of Exchange 2016 contains an Active Directory schedule update, which is automatically performed during the installation. For larger organizations, there is a good chance that a choice will be made to run the Active Directory Schedule Update from another server. This article therefore separates the two actions. We will perform the Active Directory schedule update and then the installation of Microsoft Exchange 2016. Download and install NET Framework 4.5.2. 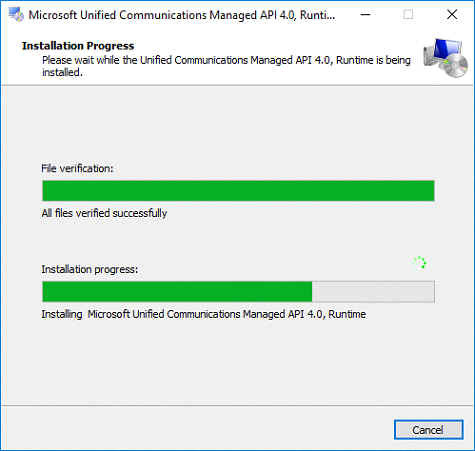 Download and install Unified Communications Managed API 4.0 Runtime. 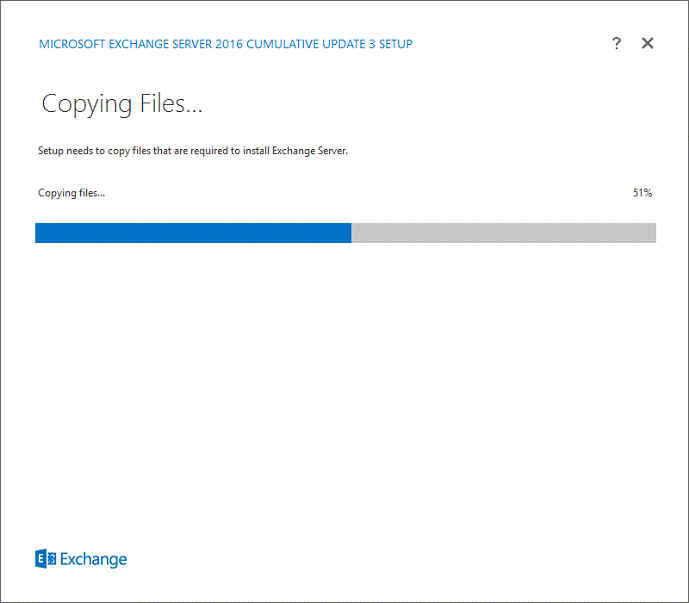 Unpack the installation files from Exchange 2016 to a folder. Open powershell and navigate to the folder where the installation files of Exchange 2016 are located. To make the Active Directory suitable for Exchange 2016, the cmdlet below must be used. If the schedule update has not yet been performed, it will also be executed in this step. In this step the Organization Name must be specified. The Organization Name cannot be changed afterwards, so choose a name that you are satisfied with until the end! All preparations for the Active Directory have now been completed. 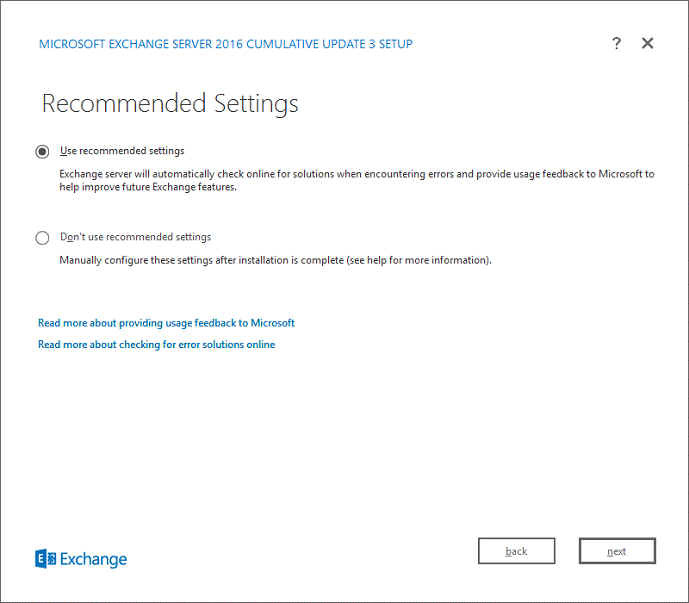 In order to be able to install Exchange 2016, a number of Features have been installed. To install the Features, use the cmdlet below. 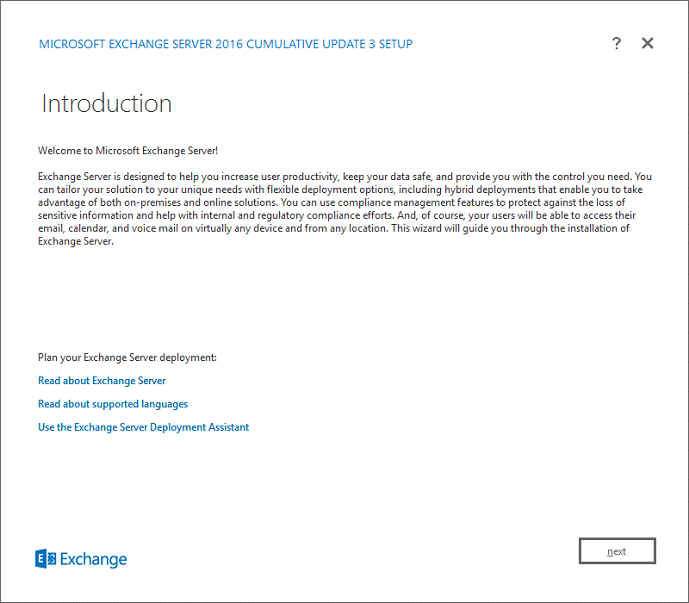 The Active Directory has been prepared, we can now proceed to the actual installation of Exchange 2016. Open setup. 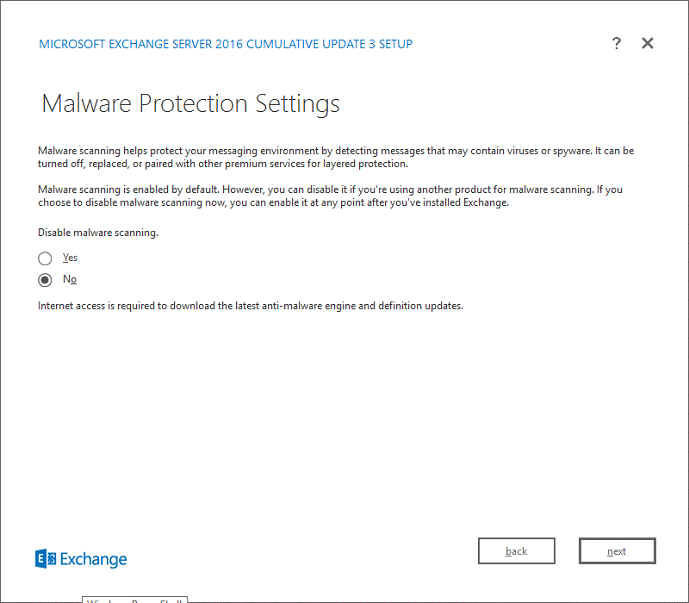 exe in the installation folder of Exchange 2016. Check Connect to the Internet and check for updates and then click Next. The updates will then be downloaded, if there are no updates available, this will be indicated. The installation files are then copied to a temporary folder. We will of course read through the' License Agreement' and of course agree with it :-) Click Next. Select Use Recommend Settings and click Next. In the next step it is important to consider what choice you will make. A mail server is sufficient with the Role Mailbox. Select only this option and click Next. The Edge Transport Role is an optional extra security feature and ensures a secure e-mail flow for incoming and outgoing email traffic. This becomes important when the mail server is placed behind a DMZ. Unwanted programs and viruses are kept out of the door. It is not as strong as other similar products like Exchange Online Protection, but certainly worth considering if you want to add this functionality to your mail server. 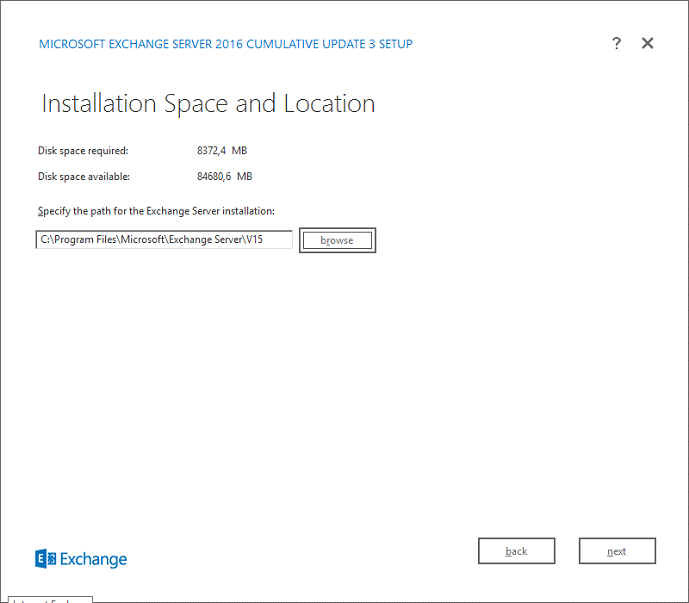 If necessary, change the installation location of Exchange 2016. Consider placing Exchange 2016 on a C:? drive and the database and the Transport Queue and Database on another partition with more storage space and disk performance. For this I would like to refer you to an article from Microsoft: Change the location of the queue database. Klik op Next. If you have followed the early steps of this manual, you will not be able to choose an Organization Name, as we have already prepared it. If you have not followed these steps, an Organization Name must be selected in the next dialog box. Then click on the Next. Select No and then click Next. If you use your own anti-virus and/or spam software, this option can be disabled. This is also subject to change afterwards. It checks whether the server meets the requirements. This is now the case, click Install. 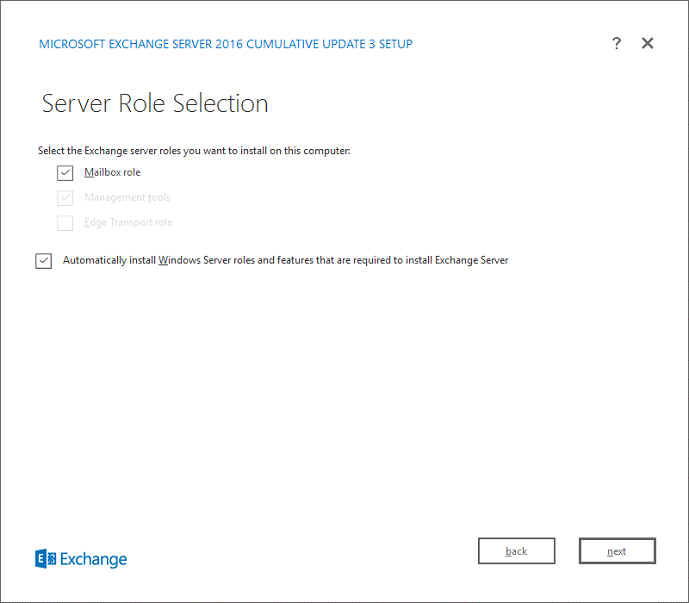 The installation of Exchange 2016 will start, this may take some time depending on the speed of the server. 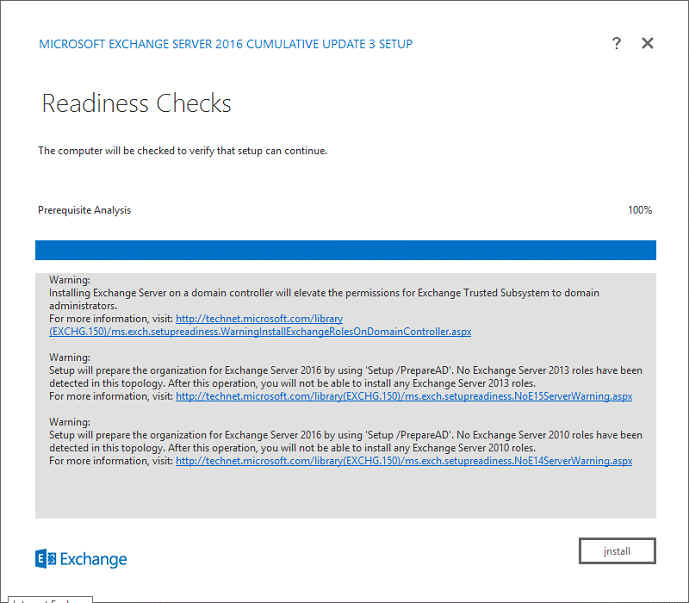 After installation, click Finish, restart the server and you can start using Exchange 2016. Activate the software before continuing to configure the Outlook email accounts.